Most people don't know that email is not secure. The only way to guarantee email security is to encrypt the entire contents of your email from when you send it, until it's delivered to the recipient. This is known as end to end encryption. When you send an email to someone, it's sent just like a plain text message so it can be read just like if you were to send a postcard or letter without an envelope in the mail. Even if you use SSL or TLS in your email, which is a pretty common setting these days, the email is only encrypted until it reaches the first mail server, then after that, it's sent as plain text! 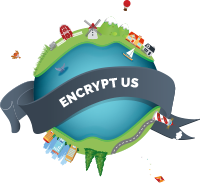 EncryptUs uses strong end to end encryption to guarantee safe passage of your confidential email messages. Not only that, when you use EncryptUs you don't need to change anything about the way you send and receive email - it's all automatic.